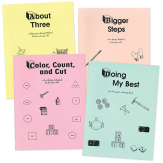 Four workbooks in the Beginner’s Activity Series provide practice for three- and four-year-olds in motor skills, hand-eye coordination, and visual comparison. About Three has simple exercises in line drawing and visual discrimination. Bigger Steps contains more advanced matching and visual comparison exercises. Color, Cut, and Count helps the child learn the colors and work with numbers. Doing My Best gives further practice in coloring, counting, matching, and cutting. These workbooks may be bought separately or as a complete set.